A Dollar General breakout should continue the strong long-term uptrend in the stock. Dollar General (DG - Get Report) shares are testing a confluence of pattern and moving average resistance. A breakout should continue the strong long-term uptrend in the stock. Dollar General's daily chart shows the stock pulling back from its August high in two groupings of lower highs and lower lows, defined by what would become the major Fibonacci retracements of the 2014 year range. It recaptured its 50-day moving average last month and is currently testing its 200-day moving average and what is now the 62% retracement level. 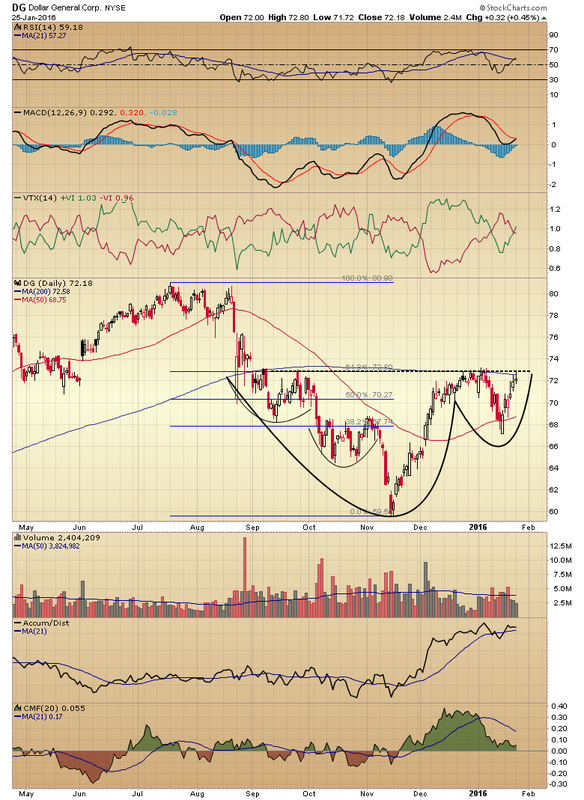 This nearly six-month price action resembles an inverse head and shoulders pattern with a complex left shoulder, or the classic cup and handle formation. In either case, the patterns represent consolidation in preparation for continuation of the previous uptrend. The relative strength index has crossed above both its center line and 21-period average, moving average convergence/divergence is above its center line and making a bullish crossover, and the vortex indicator used to identify the start of a new trend is also making a bullish crossover. These are indications of positive price momentum and trend. Accumulation/distribution is above its rising 21-period signal average, and while Chaikin money flow, a 21-period average of the A/D line, is declining, it is still in positive territory, and these readings reflect positive money flow in the final consolidation phase. The stock price is currently testing the head and shoulders neckline or the rim line of the cup and handle pattern, which is being reinforced by the flat 200-day moving average. Dollar General is a long candidate after an upper candle close above this dual resistance level. Position size should be determined by an initial stop under the right shoulder or cup of the pattern.